What is Schottky Diode And its working. 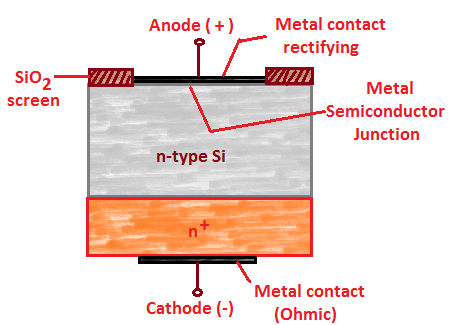 The charge storage problem of P-N junction can be minimize or limited in schottky diodes. The potential barrier is set with a contact between a metal & semiconductor. The rectifying action is depends on majority carrier only. As the result there are is o excess minority carrier to recombination hence low level of reverse recovery time. These diodes are used as rectifier at a single frequency exceeding 300 MHz to 20 GHz. A schottky diode is shown in figure. It is a metal semiconductor junction diode without depletion layer. On one side of junction a metal like gold, silicon, platinum is used and other side N type doped semiconductor is used. For protection purpose metal layer is surrounded by gold or silver layer. The metal film forms the positive electrode and semiconductor is the cathode. Operation is due to the fact that the electrons in different material have different potential energy. N type semiconductors have higher potential energy as compare to electrons of metals. When these two are brought together in contact, there a flow of electron in both direction across the metal-semiconductor interface when contact is first made. A voltage is applied to the schottky diode such that the metal is positive with respect to semiconductor. The voltage will oppose the built in potential and makes it easier to current flow. Schottky diode turns on and off faster than ordinary P-N junction diode the basic reason behind this is that schottky diodes are based on majority carrier. As there is no minority carrier there is no worry about depletion layer. It has much less voltage overshoot.